Check out my latest online course: AngularJS Unit Testing in-depth with ngMock. 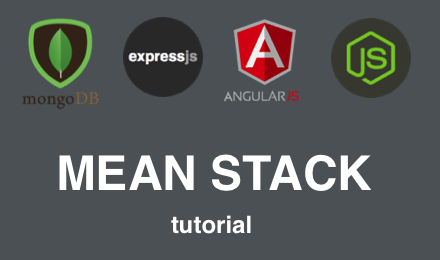 Part 3 of the MEAN Stack Tutorial. This is Part 3 of a 5 part Mean Stack Tutorial. The database has been used to build out the app but until now it’s been a little like a magic box. Let’s look at a few features of MongoDB. MongoDB has document oriented storage, dynamic schemas and data is stored as JSON-style documents. We are using schemas in this tutorial as that’s how mongoose works, but you do not have to stick to a schema as with relational databases. Two documents (rows) in the same collection (table) can have different schemas. See this document comparing sql terminology with MongoDB if concepts like collections and documents are new to you. The key thing to remember is that we are using the mongoose driver to interact with MongoDB from the Node.js server side code. This layer does a lot of the work for us, so we will only take quick look at Mongo. Something that may seem a little odd at first to some is how the databases are created automatically from the connection strings once the app is fired up. This is configurable but is the easiest way to work in a dev environment. Windows Users: You first need to navigate to where the installation of MongoDB is i.e. cd C:\mongodb\bin_. Then you can run the _mongod and mongo commands. Once the database processs is running you can view some stats at http://localhost:28017. The API of the mongoose abstraction used in this project will differ slightly from the commands in the mongo-shell but it’s useful to have an idea of what is underneath mongoose. The next tutorial works through the front-end code and AngularJS. The full source for this project is hosted on Github. Note that this version is evolving and may differ slightly from this tutorial as new features are added for the subsequent tutorials.